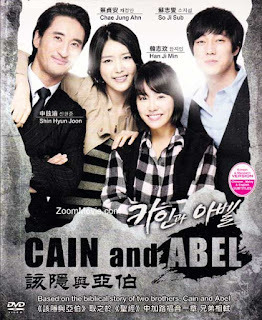 Cast: So Ji Sub, Shin Hyun Joon, Han Ji Min and Chae Jung Ahn. This is the Korean adaption of the biblical story about the two brothers, sons of Adam, Cain and Abel, where the older brother Abel is jealous of his younger brother for being popular and liked by everyone. Lee Cho In (So Ji Sub) and his older brother Lee Seon Woo (Shin Hyun Joon) are brothers by adoption, meaning Cho In is adopted whereas Seon Woo is their fathers real son, and both are very known and accomplished surgeons. Since little they have had a great relationship and didn’t care about the fact that they aren’t blood related. Kim Seo Yeon (Chae Jung Ahn) has had a heart problem ever since she was little, like Cho In, but started a relationship with Seon Woo. The relationship doesn’t last, and Seo Yeon finds love and comfort with Cho In. Before their father became comatosed, he wanted to make a clinic where Cho In was to be the head in charge, believing that Cho In knows the heart of the hospital, whereas Seon Woo is a bit selfish. Cho In’s adoption mother, Seon Woo’s mother also a surgeon, hated the fact that her son is not to take over the hospital, so she tries to arrange the board to change their minds about the decision about the clinic, while Cho In is in China for study. In China he meets Oh Young Ji (Han Ji Min), a north Korean trying to make money by tour guiding people through China, and as she is taken by some gangsters and told she is to make sure the ‘swindler’ Lee Cho In doesn’t run away from her, not knowing those gangsters are ordered by Seon Woo's mother, to make sure Cho In doesn’t return to Korea, alive. This drama is by far one of my favourite drama, K.O’ing The Vineyard Man, God of Study and IRIS. I more than loved this, seriously, just about the thought of watching another episode made me hyper and nervous (Yes, nervous! Gosh, rarely happens). Love everything about it; the brothers relationship, the love story(s), the hospital stuff, EVERYTHING! I have to admit, Korean directors should just stick with action and war, that’s what they do best. You’re probably sitting, thinking that the first part of the review doesn’t really sound interesting, well I have to admit that what I wrote is actually not what made the drama good. The drama starts with Cho In walking through the desert, shot and bleeding, actually dying, and the story starts with the back flash of his life. LOVE IT! I totally recommend this. OH MY GOD! OOOHH SAESANGAE ! i totally recommend this drama. no, i dont recommend i command you to watch it. If you want action, drama, and romance, i dont think i have watched anything like this, This drama got me keep going like forever , each episode passed so quickly and left me speechless. The first time a checked this drama out i thought i would never watch it, i saw bunji's ratings but still it didnt seem like it would be that great, BUT IT WAS! this is definitely one of best dramas evaaaaaah, the story is great, the actors are amazing (and ehmm ehmm good-looking) . I was scared, nervous, happy and all while watching it. Its one of those that bring alll the feeling back like those dramas where you think "this is what ive been waiting for! this kind of drama" . i really dont know what to say, i just extremely recommend, just watch first ep, and you'll automatically move on to the next. I didnt expect it to be that good while watching first episode but then i completely changed my mind. Omg.. du afslørede godt nok meget i denne review!! But still, it makes e wanna watch it xD Duuhh!!! But i dont have time... Damn it! !